Twitter used to provide this code on their site but for some reason they removed it in favor of these much less flexible widgets. You’ll need two pieces of code. Note: The <li>Twitter feed loading</li> is not a part of the original code Twitter provided, but it’s required to make the HTML validate. It can also provide a useful message while the feed is loading, as it could take a few seconds on a slow day. 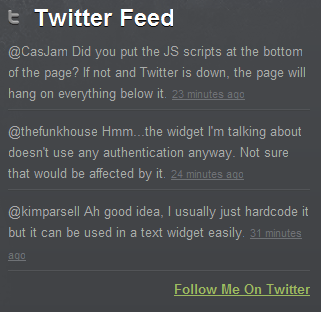 Now you can’t see the HTML markup the Twitter widget generates without using something like Web Developer Toolbar. Lucky for you, I’ve done it for you. Here’s a sample list with just one tweet as an example. #twitter_update_list a[style="font-size: 85%;"] – Selects the “time ago” link, in a somewhat hacky way (see note below). That probably doesn’t work in early versions IE because of the “!important” part. You can also use display: block; to move that link to the next line. For a live example, check out the footer of Theme Lab. Or if you’re reading this in your feed reader or an unauthorized scraper site, check out the screenshot below. The first line selects the entire list. It sets the font size, line height, and makes sure no bullet points show up. The second line makes a small 2×1 image repeat below each list item as a sort of divider. The padding sets the space between the tweet and the top edge of the divider. The margin sets the space between the bottom edge of the divider and the next tweet. The third line sets the color of the tweet, including links, and makes sure no lines show up below links. The last line sets the color of the “time ago” link. And that’s it! If I had to change one thing, I’d differentiate the the in-tweet links somehow, and maybe add hover effects on links as well. Unlike all the other how to do XYZ without a plugin posts out there, there is no actual WordPress code used in this tutorial. 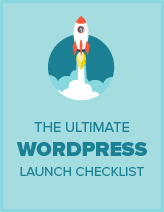 Since this uses no WordPress code, it’s not filed under the WordPress Tutorials collection. It can be used on pretty much any kind of site, assuming you can edit HTML source and CSS. As for the widget itself, you can either paste the code inside a text widget or manually code it into your sidebar (or wherever). Hope you all liked the tutorial, I’d love to hear your thoughts in the comments. If you have any requests for quick WordPress or CSS tips, feel free to let me know. It may be featured in a future Tutorial Tuesday post at Theme Lab! Leland, you may want to update your post to reflect this. Rich – looks like your code disappeared… can you try to post with some spaces please??? Looks like this is no longer working. Any ideas? Do know why the twitter feed app which you posted on your website is not functioning anymore. even on your own website is doesn’t work. Twitter basically changed the url for their feeds. Granted everything else was still working, I had assumed this might’ve been the case. The “count” is now located in the midst of the url instead of at the end, along with the username. my comment is still awaiting moderation, but I’ve found the solution on the twitter developers site. This method no longer works? I see it’s also giving this website the same issue in your footer widget. For some reason this has stopped working on my blog. Any ideas why? Does this still work? I only have the “twitter feed loading” bit coming up. If not, have you got another way? I was using this method on a few client sites. It recently broke across the board. looks like it’s not working in the footer here (themelab.com) as well. Ahhh! Anyone have a solution? Is there anyway to make the list completely horizontal? So that all three tweets display in a row rather than stacked on top of each other? I want the first tweet to scroll across, then the 2nd tweet..and so on. Rather than all 3 displaying at one time. Sorry to resurrect such an old post, I have implemented your code and it works great for IE9, but will not load for FF 14. I have had similar issues with twitter plugins, too. Chrome, blackberrry all work fine and load. Could it be an issue with my CSS and something else that is causing it to hang in FF?